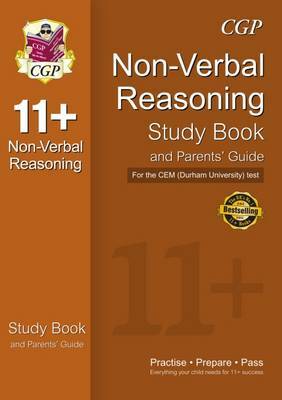 This full-colour book is a clear guide to the 11 Plus Non-Verbal Reasoning questions set by CEM (Durham University). It covers a wide range of CEM-style topics to provide students with the most effective preparation possible. There are step-by-step methods for answering questions quickly and accurately, plus round-up questions at the end of each topic (with answers). A pull-out Benchmark Test is included to help identify the level children are working at, along with a detailed Parents' Guide packed with useful advice.